As we do from time to time, we try to inspire one another on how to prepare certain food recipes. Today, we will be inspiring ourselves on how to prepare tomato fish sauce in 30 minutes. Have you ever found yourself, so hungry and you just need to fix yourself something delicious eat within a short time? Well, this tomato fish sauce is the answer! It is extremly delicious and mouth watery. - Remove the head of the fish and then break the other parts of the fish. While doing this, try and remove the dirt's in the fish. - After that, put the fish in a bowl, sprinkle salt on it, then pour hot water on it. Immediately after doing this, pour the hot water away and rinse the fish with cold water. - Peel the garlic and ginger. Put them into a blender. Also put your washed crayfish into the blender, add your fresh pepper and a little water then blend. P.S- You can slice your fresh pepper if you want. But I love doing as above mentioned. -Now add a little quantity of groundnut oil into the pot you would be using to cook. - When the oil is hot or after 1 minute or less, add your onions then stir. - Pour in your slice tomatoes and stir. - Pour into the pot what you have blended and stir. - Now add your maggi, curry, thyme and salt and stir. - After doing this, you can now add your fish into the pot and stir. - Cover the pot and leave to boil for 2 to 3 minutes. And viola, your tomato fish sauce is ready! 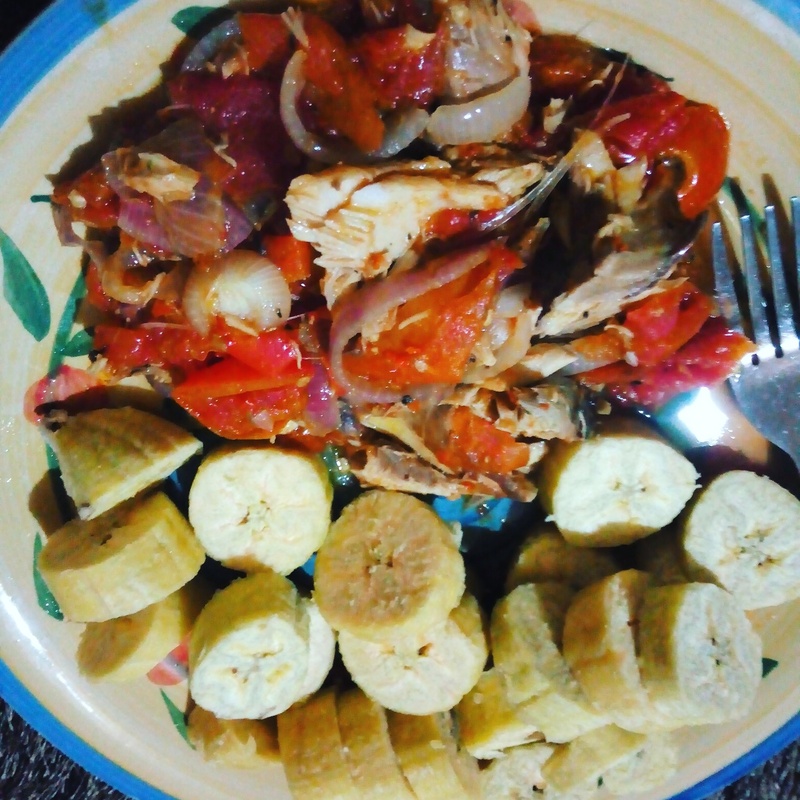 I ate mine with boiled unripe plantain. Here are reasons why you need to eat unripe plantain more. You can alao eat this sauce with boiled rice, spaghetti, boiled yam or macaroni. Trust me, you will definitely enjoy your meal.